For my handmade ghost costume, I bought an inexpensive small round white table cloth - tried buying cheap costume fabric, but it wasn't wide enough so I went with the table cloth. I wanted to give it a cartoonish appearance so I sewed black bias tape around the bottom, cut large eye holes so he could see and breathe OK and zigzag stitched the eyes with black thread to outline. That wasn't my first choice - I think the eyes would have looked better outlined with more bias tape or black ribbon. *Not recommended for little guys. My son is 3 and able to put it on and take it off by himself. Halloween is an amazing event where all the dreams of children and cosplayers can come true. You can find anything there from anime swords to indian dancers and russian painters. Although Hollywood is placed in America, this is very global environment and it gathers people from all over the world. Film industry is a very versatile place and everyone can find something to do there. Thanks for posting this. I wish it was able to be translated, but for essay writer some reason Google toolbar isn't working. I copy pasted it into another application and read the post %%!! My children are very much concerned with what to wear on Halloween. Competition is very high among children around. I was thinking to buy something inexpensive that comes within my budget. 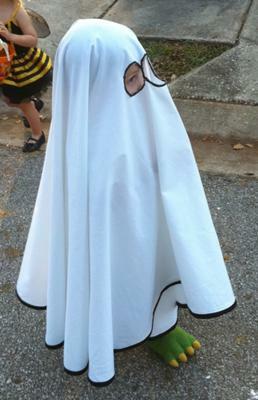 But I think this ghost costume is a good idea. I have a big white cloth, I will try on it. After my job for custom essay writing is done, I will write down my own experience. Handmade Ghost Halloween costume is very nice and very much suitable for a baby. These type of costume allows top writing services children to play happly and its a new experience for children who play with toys every day. It was nearly 90 degrees on Halloween here in FL so he needed an airy costume :) I'm sure you can relate in TX. Love the costume! He looks very cute - and very comfortable!